This week is all about Sagittarius and Capricorn. DO I HEAR AN AMEN? 18 Dec: New Moon in Sagittarius. (In Singapore, the New Moon occurs at 2:30 pm.) This is a complex and exciting New Moon. It’s conjunct Saturn (karma + limitations), conjunct Venus (love + partnerships), and trine Uranus (discovery + innovation). New Moons carry the energy of new beginnings; despite the proximity of stern Saturn, the loving energies of Venus and the exciting influence of Uranus make this an auspicious time for starting something awesome and authentic. Sagittarius is the truth-seeker of the zodiac. whatever you start, make it true to who you are – and you will be powerfully blessed. 19 Dec: Saturn in Capricorn. Cosmic taskmaster Saturn finally leaves Sagittarius to snuggle in the horned embrace of Capricorn for the next three years. Those of you with Sagittarius in your Sun, Moon and/or Rising signs would have been put through some pretty stressful times by Saturn, aka the Lord of Karma in the past two-plus years. Even if Sagittarius isn’t a huge fixture in your birth chart, look back at the past two-plus years and you might notice that you were tried and tested in the areas of your beliefs + value systems, your education + philosophy, and how you expanded your horizons to better understand that All Is One. Saturn is the planetary ruler of Capricorn; on his home turf, the Celestial Disciplinarian gets a boost of Nuh-Uh You Don’t power. He’s getting ready to crack his whip: as the planet of maturity, challenges, and consequences, victory in the next three years will be awarded to those who are willing to work very, very hard. Willing to endure suffering if it takes them one step closer to their goal. Willing to be kicked to the ground and mocked for their mistakes, then to get up and fight another day – even tougher, even wiser, and still undefeated. Remember who else is in Capricorn: Pluto, Lord of Transformation, the planet associated with the Phoenix. This all sounds very uplifting and spiritual until you remember that in the legend, the Phoenix must crash and burn every thousand years – willingly and completely destroying itself – in order to evolve and transcend. Saturn + Pluto in Capricorn are not for the weak. Over the next 3 years, Whatever no longer serves you – and needs to be released – will be revealed. New developments will emerge, inviting you to co-create with them. Evolve, and you will thrive. Cling, and you will suffer. 21 Dec: Sun in Capricorn; Winter Solstice (Northern Hemisphere). Capricorn season officially begins as the Sun infuses this diligent, ambitious Cardinal Earth sign with life-giving warmth + light. Issues related to work, structures, hierarchy and power dynamics take centre stage for the next four weeks. It’s also the Winter Solstice aka 冬至 [dōngzhì], and as an ethnic Chinese Singaporean, I’ll be celebrating with the traditional dessert known as 汤圆 [tāngyuán]: sticky glutinous rice balls in a sweet and spicy ginger soup. Eating this is supposed to bless one’s family with sweet and close bonds – very apt for Capricorn, known as the Father of the zodiac. Happy Winter Solstice, however you celebrate it! 22 Dec: Mercury stations direct in Sagittarius. The final Mercury retrograde of 2017 officially ends on this day, but don’t let your guard down just yet. The post-shadow period of this Mercury Rx lasts till 10 Jan 2018. Till then, remain just a wee bit more mindful with technology, travel, and communications. Also, remember that sometimes it’s better to be kind than to be right. So yeah, this week could get a little… intense. Onward to the reading! 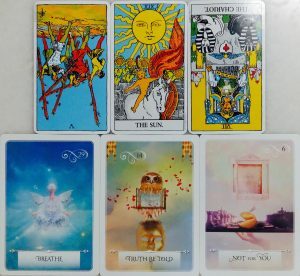 LEFT: FIVE OF WANDS REVERSED. This reading begins with one of the tougher cards in the Tarot. When the Five of Wands appears reversed, pick your fights very, very wisely. Egos, tempers, and agendas have gotten out of hand, and a once-cooperative situation has degenerated into petty drama, backbiting, and senseless conflicts. Take the higher road. do NOT sweat the small stuff – or waste your energy on the wrong people. MIDDLE: THE SUN. The potential for joy, success, and accomplishment is here for you this week – but first, the Sun must be allowed to do its job, which is to bring light into the darkness. This week, some truths will be illuminated, and some things that were hidden will be revealed in plain view. You may be surprised; you may not. Whatever you’re feeling, embrace what comes. Love the truth, even when it hurts. The truth will set you free. RIGHT: THE CHARIOT REVERSED. Get ready for a new direction to come into your life, because the structures which you had relied on in the past will no longer hold. Your Chariot has overturned, Charioteer; your horses have fled. The blessing of change is coming upon you. Will you embrace this gift of growth despite its intimidating, chaotic, and repulsive appearance? Or will you cling to the fallen wreckage and eat dust, like the dead? BE BLESSED: BREATHE. Things could get intense this week, so remember to take time out and breathe. Establish a deep breathing routine where you take five minutes off every hour to close your eyes, centre yourself, and reconnect with your inner guidance using simple diaphragm-breathing exercises. You’ll be glad you did. BE CAREFUL: TRUTH BE TOLD. This week, some truths will be revealed; others will be communicated. You might have to speak up about something that’s been bothering you for a long time. When the opportunity arises, do not fear it. Let your inner wisdom + guidance lead you to express your truth, and entrust the outcomes to the Universe. What you say could open the door to positive developments in a challenging situation. BE ADVISED: NOT FOR YOU. Some of you will really have to trust the Universe this week, because the appearance of this card indicates that some form of setback, rejection, difficulty, and/or delay may come to you. It will not be all smooth sailing ahead, but neither do you have to create unnecessary suffering for yourself by clinging to what is clearly not meant for you. It’s time to develop that wonderful mental + spiritual discipline of grounding your emotions, expectations, and thoughts. Understand that joy and suffering both come from within you, and are the outcomes of your perspectives. Cultivate a radical acceptance of things as they are, and an equally radical confidence in yourself. Know that you CAN and WILL outlast every challenge that comes your way. You can do this. You have got this. Spirit and the Universe have faith in you.